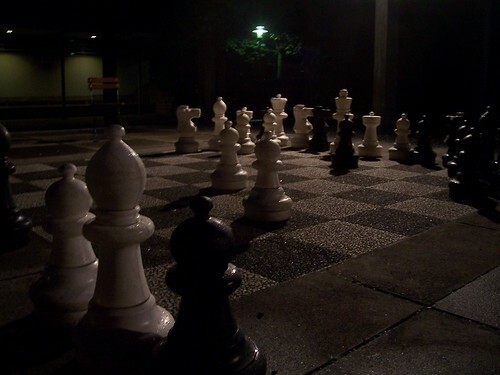 For some reason, there seems to be some consistent elements to all my recent summer holidays. They must include fantastic natural scenery. They inevitably include moving around between multiple hotels. And they are almost always me filling a memory card full of photos. What has changed over the years is the method of transit. In 2005 it was driving round Iceland. 2006 saw us moving round Norway by public transport, with various degrees of success. Meanwhile in 2007, part of France was traversed by foot. Okay so France 2007 was a walking holiday, so you’d expect us to be using our feet. And whilst last years trip to the Queyras was amazing, and we do enjoy walking, we didn’t really see much of the local sights. Which is why, on Sunday 17 August, we were in the basement of the Hotel Victoria in Meringen looking at two bikes that would accompany us on our travels for the duration of our holiday. Cycling had seen the obvious answer. You can travel quite reasonable distances on good paths and roads, and because cycle paths tend to connect towns well, it’s easy to pop around and see various local sights. As long as they’re not up big hills anyway. 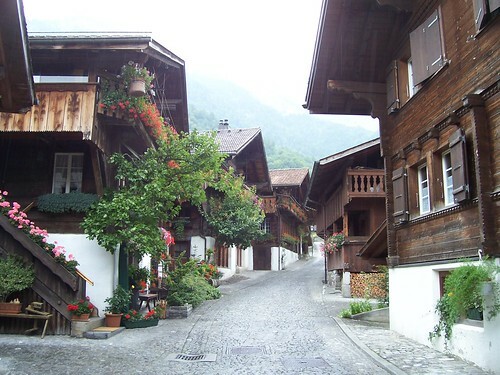 We’d booked in on Inntravel’s Interlaken Valleys and Villages holiday, with an extra day booked in midway, and another at the end in Bern. We’d used Inntravel the year before for France, and were satisfied customers. We could no doubt have done it cheaper, but it’s so much easier to leave the organisation to someone else on holidays like this. Like their walking holidays, you’re given a batch of route notes and maps to help you on your way. And so it came to pass that we left the hotel and headed out. The first days cycle from Meiringen to Brienz and back again, was a relatively flat and simple 26km run – a gentle warm up. Catherine hadn’t been on a bike for about 7 years and I’d only been on one once in the same time period, so it was time to reacquaint ourselves with gears, brakes and being saddle sore. 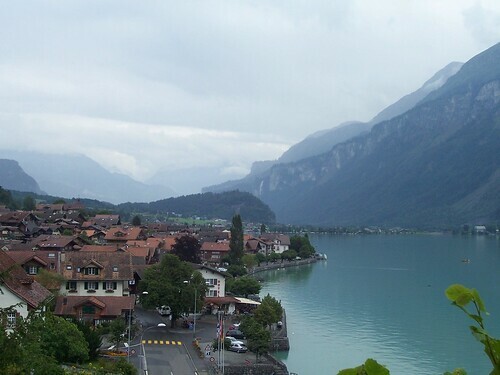 Within no time we were half way done, and in Brienz – a lovely little town sited at the end of the Brienzersee lake. Parking our bikes up at the ample cycle racks at the train station, it was time to explore. 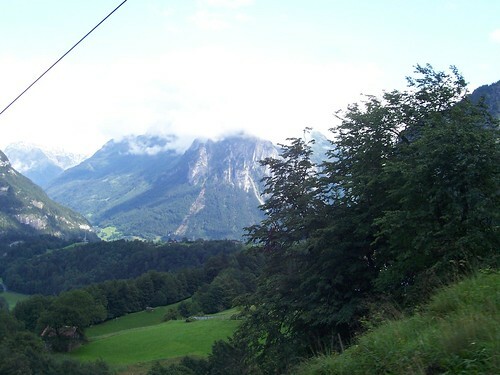 The first thing we spotted was naturally the funicular railway – the Brienz Rothorn Bahn. 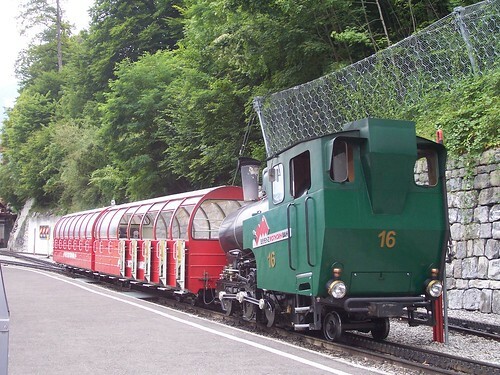 As we’d find out, where there’s a hill with a good view, the Swiss have probably built a funicular up it, but the Brienz Rothorn is the only one to regularly use steam locomotives on its line. Unfortunately we hadn’t known about it before hand, and didn’t really have time in our days plans to undertake the two hour round trip. We quickly found that we could easily have spent at least another day in the Meiringen/Brienz area and still not done all the interesting things that there are to see. We walked along the lake side, then up the hill slightly towards picturesque streets of wooden houses, some dating back to the 17th century, and adorned with elaborately wood carvings. A church sat even higher up, with a commanding position on a hill, giving a wonderful view of the town and the lake. It’s just a shame that the sky had been trying to rain all morning – Switzerland suffering too the inconsistent summer that Britain was also “enjoying”. It was also lunchtime, and having wandered aimlessly round town with no real idea of what to do about food, we ended up eating at the Bistro Rothorn opposite the train station. For some reason, it’s promotion of hamburgers and hot dogs hadn’t exactly filled me with optimism, however it also featured the Swiss speciality of rosti – sometimes translated into “Hash Browns” in some other restaurants. Given Switzerland created this wonderful grated potato product in the first place, this seems rather a crime to give it another other than its proper name. The Bistro location of right next door to the Brienz Rothorn Bahn station lead to the slightly surreal experience, and vaguely depressing experience of listening in to a conversation from a family who knew a lot about the funicular, its carriages and its trains. And were also clearly the people who other parts of the menu were targeted it as thick Yorkshire accents started every conversation in English as they asked the German speaking waitress for a “kids hamburger and a Fanta”. After munching down our wonderful rostis, it was time to hit the road again and cycle back to Meiringen. A small detour when we managed to take the wrong route down a main road meant we nearly missed a promised “secret military underground bunker” which is so secret that its tunnel appeared on our cycle map. It also had an element of the unused about it – railway lines into the tunnel were rusting, and had no connected to the main railway line which we’d also cycled along. Before we knew it, we were back in Meiringen and it was only early afternoon. Not back to the hotel just yet though, as we cycled along to our next stop. 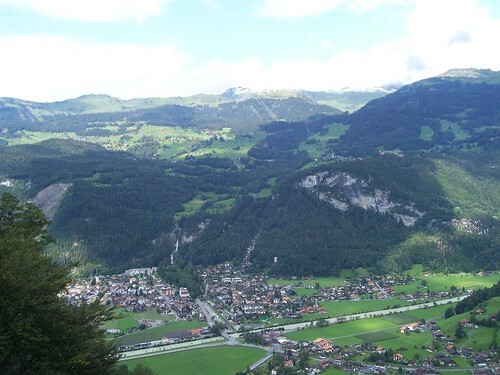 Meiringen has two claims for fame. One is that it’s home of the meringue but sadly there’s no giant monument made of whipped egg whites to visit. 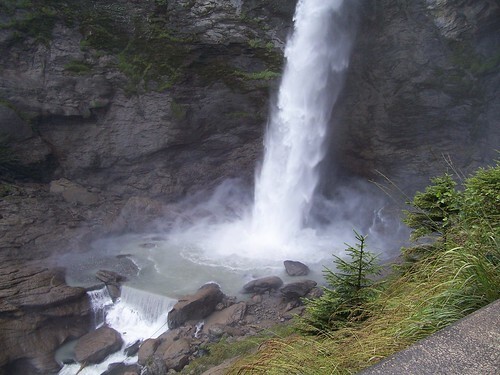 The second is the Reichenbach Falls – where Sherlock Holmes plunged (apparently) to his death. Now the falls are best viewed up a hill. Which is a lot of effort to walk up when you’ve just cycled 26km so those wonderful Swiss built a funicular railway! We’d arrived just in time for a train going up, and squeezed on board as the wooden car took us up a vertical distance of 244km to the main viewpoint. 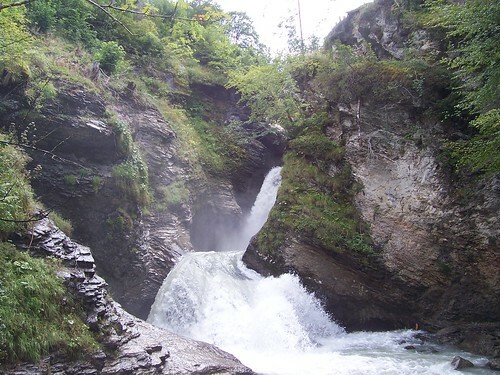 Sir Arthur Conan Doyle had visited Switzerland in the 19th century, and this particular waterfall had made such an impact on him, that he decided to end Holmes’s life by falling into the waterfall after a struggle with Moriarty, in The Adventure of the Final Problem. To see the site where it all happened was very moving indeed, and I couldn’t help but dab my eye and doff my cap in respect to the passing of that remarkable man. At the end of the viewing platform was a path leading up, which everyone else had started climbing, so not to be left out, we did too. The path leads further up the hill, and we were soon rewarded by our effort by some stunning views of Meiringen and of further parts of the waterfall. One thing that we weren’t warned was to not go too far up – the top consisting mainly of a road to a village and a hotel with a self service cafe which just served to let the summit down a bit. Back down at ground level, there was still more to do with a visit to the nearby Aare Gorge, which Catherine assured me was an “interesting gorge”. Well with salemanship like that, we just had to go. How do you describe the Aare Gorge? It seems almost impossible without pictures, so it’s a good job I have so many. 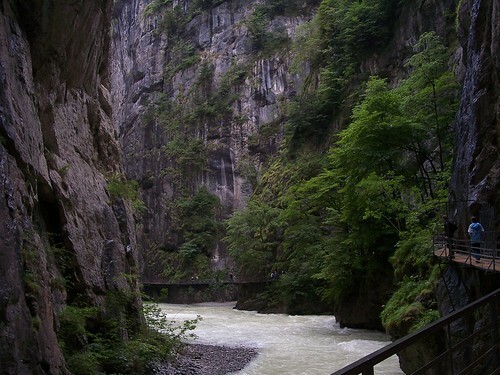 It’s around 1.5km long – a pathway that follows the Aare River as it flows between two towering cliff faces. A mixture of tunnels and woodern walkways bolted along one side, it just seemed to keep going on as we followed the steady stream of tourists from the west entrance, along to the east. At the eastern end, our walk was rewarded with stunning views of the other side of the valley and the snow topped Mahrenhorn. And once you’re at the other end, well you’ve got to come back haven’t you? 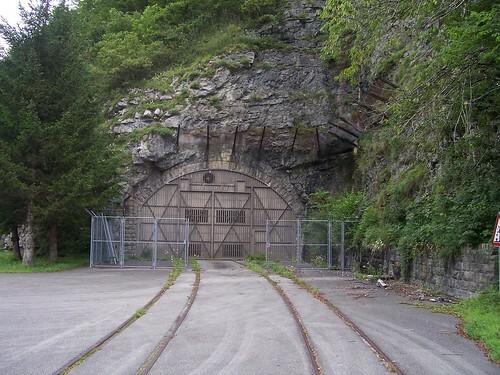 In another feat of Swiss engineering, there is actually a narrow gauge railway that runs in tunnels alongside the Gorge which many people take back. We opted to walk back along the pathways – now quieter as the evening was getting closer. The weather was also getting closer. 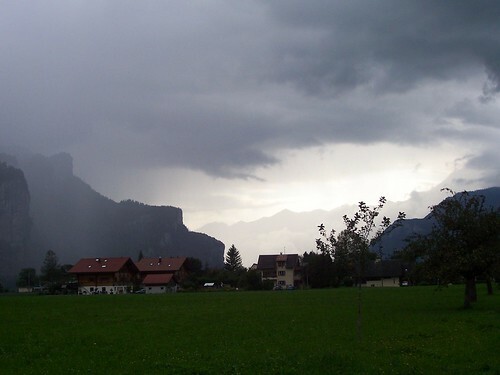 Having avoided any major rain, the heavens were about to open – the rain was coming. Oh, if you’re thinking this is just a small, country town thing, it’s not. Bern had more than a few sets too. If you dare, you can go through all 122 photos of day 1 over on Flickr – which are all part of my Switzerland 2008 photoset. Cool! Really enjoyed reading abut day 1. I can’t wait to go back myself in January. The Aare Gorge has always been on my ‘to visit’ list but I’ve never managed to get around to it. I’m hoping you ventured into the Lauterbrunnen valley and up into the mountains. Looking forward to reading the next instalment. 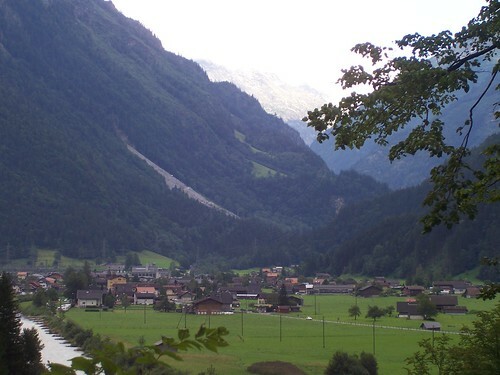 Lauterbrunnen will be a tiny slither of day 3 and all of day 4 too I think!